April 24, 2016 (Tony Cartalucci - NEO) - Thailand-based newspaper Bangkok Post in its article, "Yingluck denies Thaksin's involvement," refers to ousted, US-backed dictator Thaksin Shinawatra, removed from power in 2006 by a military coup after nearly two terms in office trampling the rule of law and the lives and livelihood of the Thai people, and claims that he has extensively relied on foreign lobbyists in a bid to return to power. During this struggle to return to power, he has placed a series of proxies in his place, most notably his own brother-in-law Somchai Wongsawat who served as prime minister in 2008, and his own sister Yingluck Shinawatra who served as prime minister from 2011-2014 before being removed by a subsequent coup. 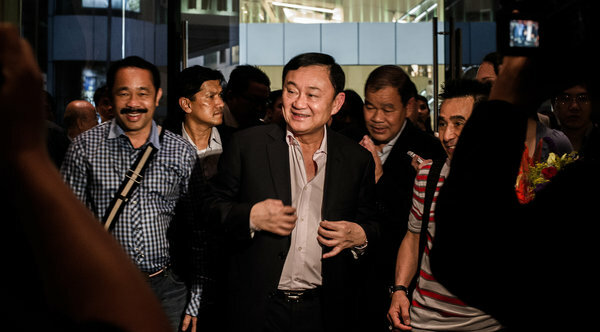 Image: Thaksin Shinawatra (center) is a convicted criminal who fled Thailand to evade a 2 year prison sentence, multiple arrest warrants, and multiple pending legal cases. He is one of the worst human rights violators in Thai history, nearly 3,000 people during his time in power, and resorting to armed violence in his bid to seize back power. He is also benefiting from immense lobbying efforts arrayed behind him by Washington. Thaksin's legal counsellor Noppadon Pattama denied the allegation on the same day, saying Thaksin did not hire lobbyists or was behind criticisms of foreign governments or international organisations against the junta. Ms Yingluck on Friday confirmed Mr Noppadon's account. "I believe every country considers all facts and listens to all sides before making a decision. It won't let its decisions be dictated by lobbyists Life is hard enough for him [Thaksin] abroad and he's unlikely to plot such things." However, both Pattama and Yingluck Shinawatra's statements are verified lies - easily verified lies. 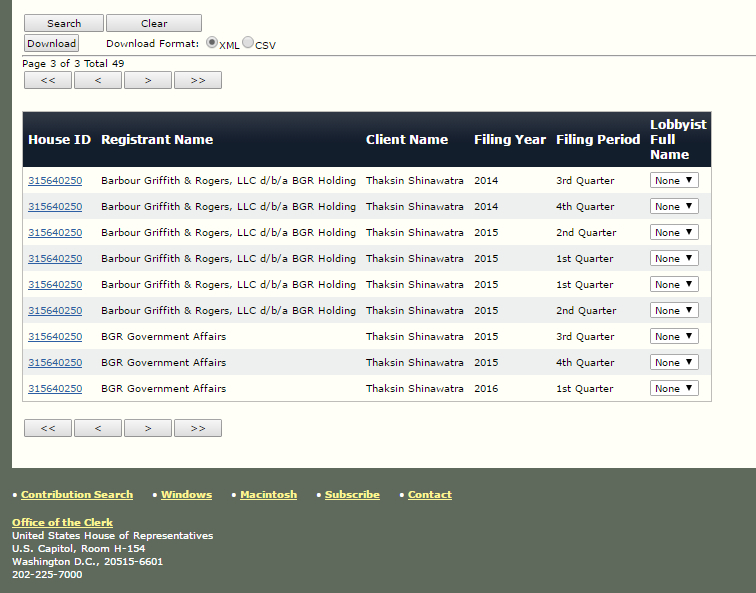 By law, clients seeking to lobby in the United States must register through the US House of Representatives in their "Lobbying Disclosure" database. By simply entering "Shinawatra" into the client search field, a total of 49 documents turn up, dating from 2006 when Shinawatra was ousted from power, up to and including this year, 2016. This exposes Pattama and Shinawatra's comments as outright, verified lies and is yet another affirmation as to the true nature of their agenda and the means through which they attempt to achieve it, and goes far in explaining why Thailand's current government has gone through such lengths to prevent this political machines from seizing back power. 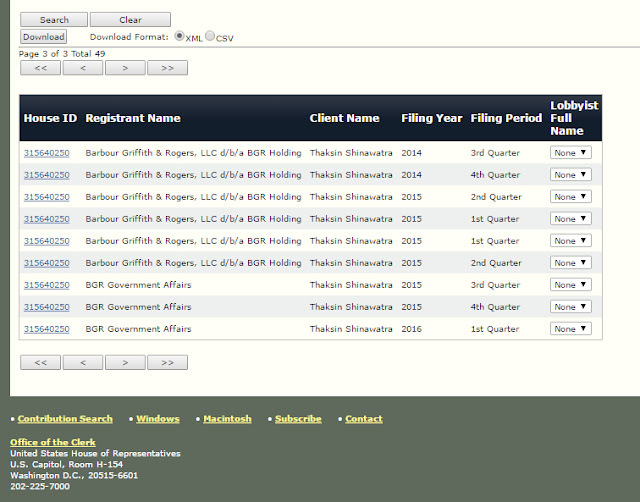 Lobbying firms propping up Shinawatra's political machine since 2006 include Amsterdam & Peroff, Baker Botts, Barbour, Griffith & Rogers (BGR), and Kobre & Kim. This has been done by both coordinating political stunts within Thailand through US State Department-funded nongovernmental organizations (NGOs), and planting favorable spin throughout the Western media which unquestionably portrays Shinawatra as "pro-democracy" and those that ousted him as "anti-democratic" and "dictators" - a familiar and essential ingredient in Washington's regime-change recipe. 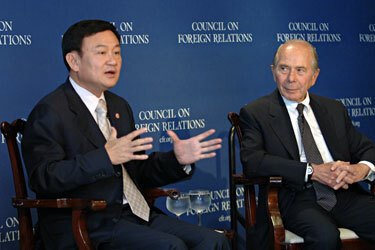 In reality, Shinawatra's utility for special interests on Wall Street and in Washington are the sole purpose he is being backed by the US - having committed Thai troops to the illegal invasion and occupation of Iraq, hosting the US CIA's abhorrent rendition program on Thai soil, and attempting to ramrod through an illegal and unpopular US-Thai free trade agreement in 2004. Shinawatra - a serial human rights offender - has maintained his grip on power not only with the help of foreign sponsors, but also through a campaign of intimidation, violence, kidnappings, assassinations, and terrorism. In 2009 and 2010 he attempted to seize Bangkok with mobs bused in from across the country. In 2010, those mobs included 300 heavily armed terrorists wielding AK47s, M16s, hand gernades, and even rocket propelled grenades (RPGs). The violence claimed nearly 100 lives and culminated in nationwide arson carried out by his supporters and mercenaries. Image: One of Shinawatra's heavily armed mercenaries takes aim with an M16/M203 in the middle of Thailand's capital city of Bangkok. 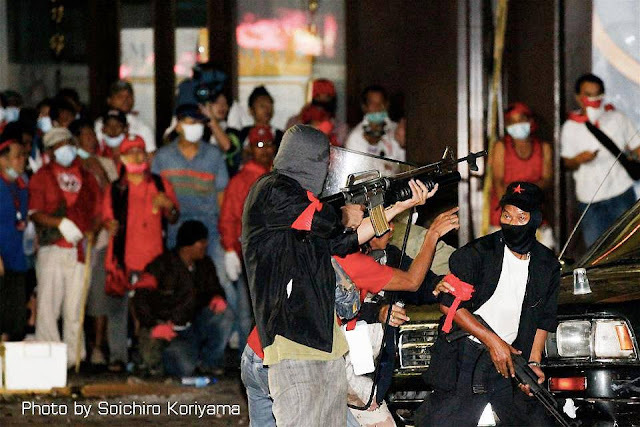 It was the beginning of weeks of gunfights that would leave nearly 100 dead including soldiers, police, protesters, and bystanders and culminate in nationwide arson, including extensive fires and looting in Bangkok itself. It is easy to see why Thailand was eager to remove Shinawatra from power, and eager to keep him and his proxies from ever returning to it. Considering his utility to Western interests while in power, it is also clear as to why he has been able to marshal such impressive lobbying behind him. It is not simply a criminal billionaire buying off US support, it is the US cultivating a proxy with which to influence and control Thailand through. Either way, the presence of such lobbying casts into serious doubt the torrent of criticism the US, EU, and UN have leveled against Thailand since the ouster of Shinawatra. And while Shinawatra's supporters in Thailand attempt to claim that the US, EU, and UN would still be critical of Thailand without the influence of special interests and lobbying, this too is an easily verified lie. One only needs to consider US, EU, and UN relations with Saudi Arabia, undoubtedly the most totalitarian regime on planet Earth, guilty of egregious human rights abuses, and absent even the feigned semblance of democracy. 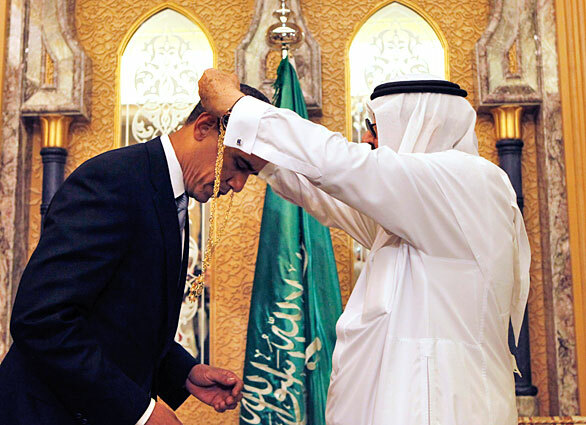 Yet despite these realities in Saudi Arabia, the US and EU eagerly arm the regime in Riyadh, provide it with substantial political support, and literally defend it with military bases arrayed along its borders while providing logistical and military aid for various acts of direct and indirect aggression against Saudi Arabia's regional neighbors. It is quite clear that the US and EU do not consider principles when condemning one nation for alleged violations of human rights and deficiencies in "democracy," while excusing others, and instead only consider utility and convenience in doing so, even at the expense of these very principles. Image: Contrary to popular belief, the United States does not care about human rights or democracy and instead only uses such principles to undermine its enemies when convenient, and trampling these same principles in propping up loyal regimes who hold human rights and democracy in open contempt, i.e. Saudi Arabia. It is apparent that this same charade is taking place throughout the rest of Asia, with lobbyists and US State Department-funded agitators propping up pro-US political fronts everywhere from Malaysia through Anwar Ibrahim to Myanmar through Aung San Suu Kyi, to the Philippines and Laos, seeking to overturn nearly a generation of struggle by Southeast Asia to reestablish independence after centuries of European and American influence and outright colonization. The overt nature of US lobbying and meddling in Thailand is a warning and of grave concern to the rest of Asia. Failure to help expose and condemn this extraterritorial meddling by the United States through such means will simply ensure that should Thailand succumb to such a campaign, Thailand's neighbors will inevitably be next. In the case of Myanmar, they have already.